With the romance of Valentine’s Day no longer in the air, the Better Business Bureau is bringing singles back to cold, harsh reality. A recent investigation released by the organization reveals the staggering proliferation of online dating scams and the financial devastation left in their wake. 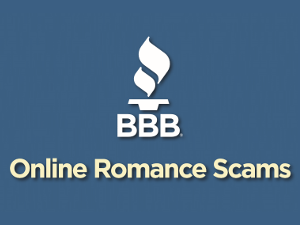 According to the BBB, romance scam victims in the United States and Canada have reported losing nearly $1 billion in the last three years alone. It’s a remarkable number by any standard, but researchers estimate it may represent only a fraction of the actual damage, as many victims are too embarrassed to report their experiences or file complaints with law enforcement. It’s not the only figure in the BBB report likely to drop jaws. One featured expert estimates that there may be 25,000 scammers online with victims at any one time. A company that screens profiles for dating companies claims that 500,000 of the 3.5 million profiles it scans every month are fraudulent. The BBB estimates that there may be more than a million victims in the U.S. alone, and the FBI’s Internet Fraud Complaint Center believes romance fraud is behind the greatest dollar loss of any scam that affects individuals, with the exception of investment frauds. Contact. In the first stage, scammers use dating websites, apps, Facebook, and other social media outlets (often using stolen credit cards to sign up for paid accounts) to meet victims. Shortly after initiating interaction, they encourage their victims to move to a different form of communication, such as email or texting, to reduce the likelihood of a site identifying and shutting down their deception. Grooming. Fraudsters use the second stage to learn more about a victim’s life and build trust. During the grooming process, con artists maintain regular - perhaps daily - communication, send flowers and other small gifts, and may begin requesting small favors. They also may attempt to isolate their victims from friends and family who might voice suspicions. The grooming stage can go on for months until sufficient rapport is built. The Ask. A scammer will finally ask for money when he or she deems that a sufficient amount of trust has accumulated. The request will typically be framed as necessary for an emergency or business problem, or to purchase a plane ticket in order to meet. If the victim complies, the scammer will find ways to continue asking for more. Continuation. Clever cons have found a way to continue deceiving victims even after a target has discovered the fraud. A second phase of the scam purports to help the victim get their money back. A fake law enforcement official may reach out to say the scammer has been caught and the victims can reclaim their money – if they spend several thousand dollars in fees. In other cases, the original scammer will claim that the “relationship” started as a scam but became genuine love, and the cycle continues. The BBB offers tips to help savvy singles protect themselves. Beware of anyone who seems too perfect, pushes you to move communication off a dating service too quickly, talks at length about trust, makes excuses to avoid meeting, and sells a sob story about a tragic past or being down on their luck. Never send money or personal information that could be used for identity theft to someone you’ve never met in person. Cut off contact immediately if anything raises a red flag.